I've kicked off my 2015 by submitting a new theme to the WordPress Theme Depository: Lovecraft . 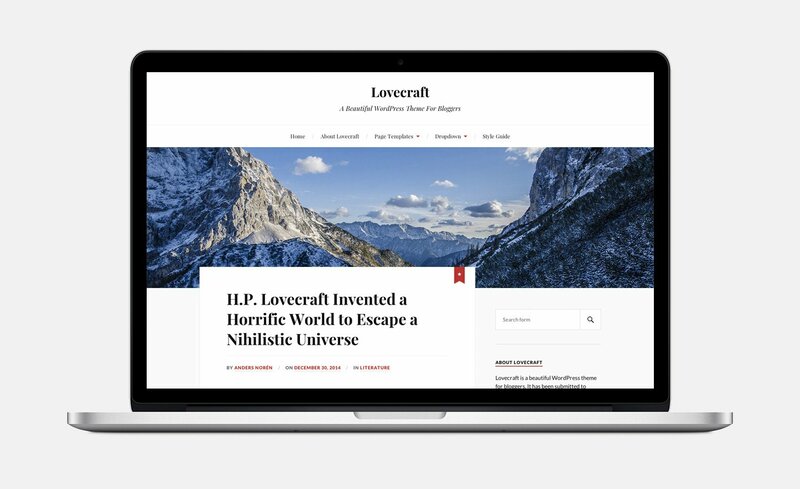 Lovecraft is probably my most traditional WordPress theme since Hemingway and Wilson. It’s a standard run-of-the-mill two-column blog theme, with content to the left and a sidebar to the right, but it’s got a lot of style and some nice twists. I’ve wanted to do something with Playfair Display for a long time, and I’m pretty pleased with the results. You can read more about Lovecraft here and see a demo here. Lovecraft is my first theme since summer, and given that I’ll be writing my bachelor thesis this spring, it’ll probably be a while before I make another. It’s been a fun Christmas project.